We run a mixture of accredited and non accredited courses at the community farm. 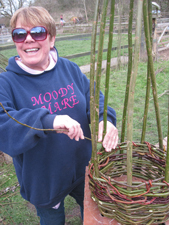 We often run half day / day workshops including Spoon Making, Spinning Wool, Living Willow Construction and Hurdle Making. We are an Approved Ascentis delivery centre and can offer accredited courses in Beekeeping, Gardening and Animal Care. Please contact Kerry Rowe - Education Coordinator 01179 381128 kerry@lwfarm.org.uk for more information. Join Kerry to learn the peg and loom method of using raw fleece to make a rug. Using fleece from the Farm's Jacob Sheep you will learn how to card and prepare fleece ready for weaving on a peg loom. This thoroughly enjoyable method of weaving can be learnt very quickly. We will aim to complete a small rug that will fit in a bag / rucksack ready to provide a comfortable and waterproof seat anywhere you go! Bring some lunch. Hot drinks provided. Adults only. To buy a ticket please click here. This is a Two Part Workshop. The Ticket Price includes both sessions as described below. It is the ticket holder's responsibility to make their own way to each session. Full directions will be provided. This workshop is led by Juley Howard who has run a successful small holding of her own for 15 years. Part one of the workshop will look at general issues around running a smallholding, including land management, planning, complying with legislation, and specific issues such as animal husbandry, growing vegetables and fruit, growing food for livestock as well as other products such as willow and hay. We will briefly look at finance and marketing surplus produce and discuss issues such as how to finance a smallholding from scratch depending on the interest of the group. Finally how to skill up so that you can get things done yourself and where to go for support. Part Two @ Juley's Smallholding in Yatton 10am to 1pm, Saturday 27th April 2019 Part Two of the workshop will cover the same general issues as part one. For more details and to buy a ticket please click here. Step into the light half of the year with a spring in your step! The land is waking up and there are lots of plants shooting up that are bursting with minerals and bioflavonoids. You don't need to spend a fortune on supplements and products that have been shipped halfway round the world. There is healing and health all around us right here. Join Helen Gray from Malago Medicinals for an afternoon of herbal delights! Helen is a qualified medical herbalist who has been foraging for over 20 years. She loves to empower people to improve their own and their loved one's health, as well as connect to the land and its history and seasons. This workshop will involve a short walk around the farm identifying and collecting common wild plants. Helen will talk about the traditional and modern uses of the plants and their properties, and how to safely indentify and collect them. We will then have a wild tea tasting session and prepare an amazing herb vinegar to take home. There will also be a tasty wild plant snack to try. There is uneven ground on the farm. Please call if you have access needs. Adults only. To book tickets please click here. Make a useful utensil from absolute scratch! Starting with a log you will use traditional greenwoodworking tools to; split, axe, shave, carve and whittle yourself a spoon. You will rough out a blank, hollow out the bowl and refine the shape, as well as discussing the safe use of tools and the properties of different woods. Wooden spoons are invaluable in the kitchen or when camping. Creating something with your hands is a fantastic way to 'unplug and unwind', espcially if outside in nature. 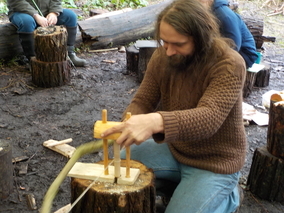 This day will set you up with some basic greenwoodworking skills so you will be able to make other small items. Info will be given on the best knives to purchase if you want to keep whittling away at home. This course is held outside in our Water Vole Woodland. There is uneven ground. Please call if you want to check access needs before booking. Adults only. Please bring lunch. Hot drinks provided. A great way to learn a basic survival skill. Creating an ember and fire with a bow drill is hard work and requires perseverance but leads to a fantastic sense of achievement! We will learn the basic principles of fire lighting without matches, how to select materials, prepare a tinder bundle and nurture the precious spark into a flame! Bow drills will be supplied to use and ideas given for how to make your own at home. This course is held outside in our Water Vole Woodland. There is uneven ground. Please call if you want to check access needs before booking. Adults only. Please bring lunch. Hot drinks provided.